Providing leadership development experiences and opportunities for urban youth pursuing the arts. "Developing the leaders of today through the arts one life at a time." Led by international recording artist, and Executive Artist in Residence, Brian Owens, STERLING BANK FOR L.I.F.E is a creative community partnership committed to enriching the lives of St. Louis area youth through music, art and technology. The goal of this nonprofit us to mentor and develop the next generation of leaders and innovators by providing platforms that will impact our community. Since the spring of 2013, recording artist and community leader, Brian Owens and Sterling Bank have providentially nurtured a relationship bound by a shared commitment to community, faith and enriching the lives of our fellow neighbors one relationship at a time. L.I.F.E Compositions Songwriting is a one on one mentoring program for junior high students of ages 11- 14. Students have one on one sessions with music therapists to compose original songs. Sessions include the use of therapeutic songwriting that focuses on the student's mental and emotional well being. Brian had the initiative to reach out to junior high students of a local charter school to give them the opportunity and experience to write and professionally record their own song. He was informed that most of the students attending the school dealt with urban trauma; traumatic experiences due to the state of their environment. The aspiration of the program is to give the students the opportunity to constructively express themselves through music. The one on one therapeutic songwriting gives them the time, attention, resources and encouragement to accomplish the task. More importantly, it is the overall goal that the students learn more about who they are, feel validated and empowered to be leaders in our world today. 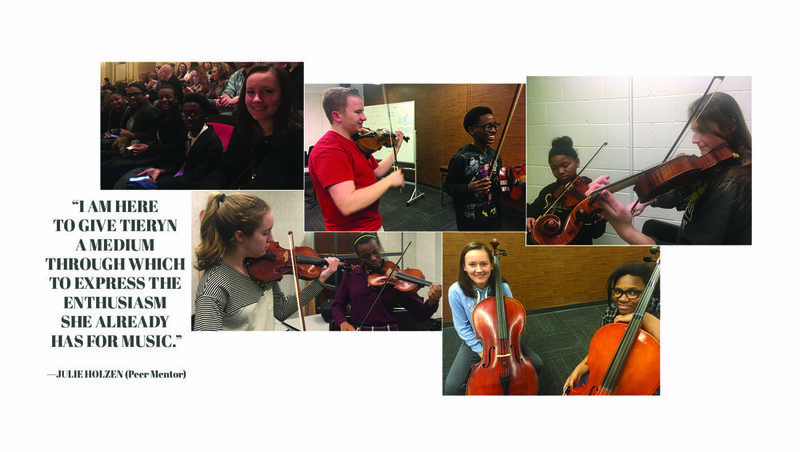 Peer to Peer Mentoring is a program where talented young musicians from the STL Symphony Youth Orchestra mentor young minority musicians from underserved schools around the St. Louis area. The purpose of the program is to diversify the classical music community through accessibility and human connection. Students are given the opportunity to sit in on youth orchestra rehearsals, receive tutoring from his or her mentor, attend STL Symphony concerts together, and perform side by side in selected concerts. Through Peer to Peer Mentoring, both the mentor and mentee are exposed to new experiences that create a sense of community and develop a culture of mentorship in our next generation of artists and audiences. The Remix Project Ensemble began as a non auditioned ensemble in the spring of 2015. After their debut in June of 2015 they quickly captured the hearts and minds of audiences with the innovative approach to traditional spirituals, infusing various styles including hip hop. After being featured on the Life Compositions Vol 1. recording, and two appearances on the Nine Network, founders Duane Foster and Brian Owens began to make plans to audition and formally organize. In March 2016, the Remix Project Ensemble was officially launched. After only 3 rehearsals this talented group of teens debuted at the historic Peabody Opera House for an audience of 3100 attendees. A Maryville University music therapy partnership uses music to bring relief to children whose daily experience includes a range of traumas involving poverty and violence. Working at Confluence Academy-Old North, a charter school located in St. Louis, music therapy students help middle schoolers pour their feelings into instrumentals and lyrics through a program called Life Songs. Singer Brian Owens started the project in Spring 2015. It’s part of the Sterling Bank for Life Community Partnership, a program Owens put together through the bank and his employer, the St. Louis Symphony. 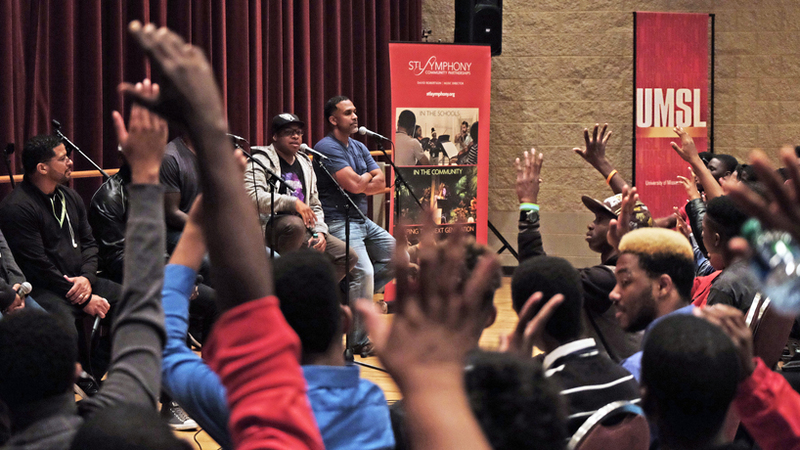 Brian Owens (center), the Des Lee Community Music Artist in Residence, was instrumental in connecting Take 6 with a crowd of young singers at the Blanche M. Touhill Performing Arts Center in October. In addition to UMSL’s own University Singers, about 90 students from Riverview Gardens, Jennings, Ferguson-Florissant and St. Louis high schools packed the Whitaker Room for the free Lunch and Learn event. Want to support our mission? By donating to L.I.F.E Arts with a one-time or monthly recurring gift, you help to deepen our reach.